The squirrels at Mt. Mercy College are getting too friendly—they're frightening the students, making the nuns jumpy . . . and they're super messy. It's time to call the Animal Rescue Team! Meanwhile, Keisha's got a problem of her own. The Grand River Steppers jump rope team has a chance to win first place in their school district this year, but Keisha's so nervous, she keeps messing up! When she and Daddy go to the Veteran's Facility to check out their squirrel situation, Keisha meets Sergeant Pinkham, who's learning how to use his new prosthetic leg. Could Sarge be just the person to help Keisha stay calm, do well, and have fun at the competition? 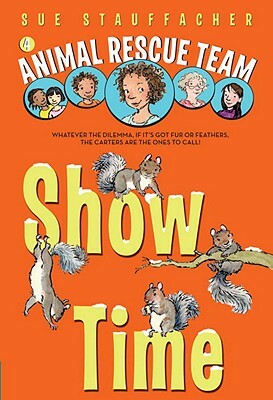 Perfect for independent readers, the Animal Rescue Team books offer adventurous and heartwarming stories with lots of laughs—and plenty of critters. Sue Stauffacher lives with her husband and sons in a 150+ year old farmhouse in the city of Grand Rapids, Michigan. Over the years, possums, bats, raccoons, mice, squirrels, crows, ducks, woodchucks, chipmunks, voles, skunks, bunnies and a whole bunch of other critters have lived on the property. Though Sue is not a rehabilitator herself, she is passionate about helping kids know what to do when the wild meets the child. A longtime advocate for literacy, Sue speaks around the country, connecting kids with books to help grow lifelong readers. She is a former book reviewer, and her novels for young readers include Harry Sue, Donutheart, and Donuthead. To learn more about Sue and her books, visit her on the Web at www.suestuaffacher.com.